Hollywood Comes to the Broadmoor! Loaded with “Pizazz,” this stucco and glass contemporary offers a serene setting and an ambiance all its own. 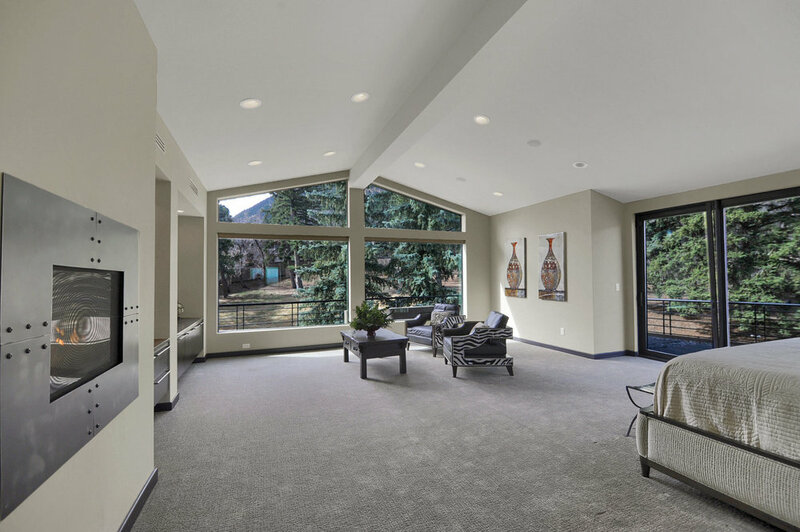 Nestled on 2.73 prime acres behind the five-star Broadmoor Hotel, this premier home has 8,731 square feet and represents an architecturally correct work of contemporary artistry. In addition to the home’s interior flair, the property also offers the ultimate in outdoor living with its lush grounds, water features and an expansive patio that overlooks a heated swimming pool with hot tub and fire pit. Automatic sprinkler system for yard. Since 2015, the sprinkler system has undergone a major upgrade to include an expanded system for the entire yard. Gorgeous landscaping with three water features (front water fall, waterfall out kitchen window and lagoon area with water rock on the back patio.) Note: all the water features have new liners. Heated, in-ground swimming pool with an industrial grade heating system that was installed in 2015, the pool has a raised deck area with porcelain tiled floor and a new built-in hot tub with Batu wood decking. Tiled floors in the Atrium were replaced with new wood floors and then all the hardwood floors were refinished. The moment you enter this home, you’ll know that this home is truly extraordinary. Upon entering, a spectacular atrium with two- tiered slate fountain, 24’ peaked glass ceiling, hardwood floors and curved built-in seating welcomes you. 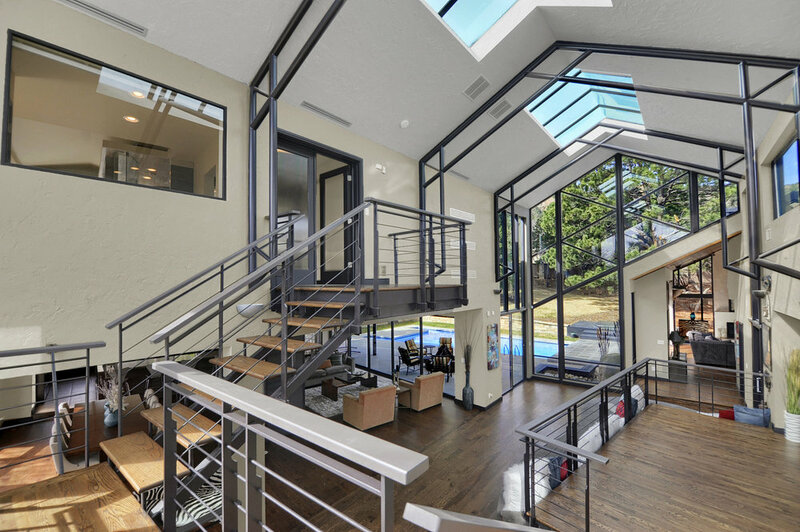 The atrium, which opens to all the major living areas, serves as a dramatic focal point for the home. The living room offers lovely oak floors, 3 symmetrical coved ceilings and a dramatic floor to ceiling metal fireplace wall with sculpted steel gas logs by artist Doyle Svenby. Perfect for entertaining the living room also has a wall of glass doors that stack. 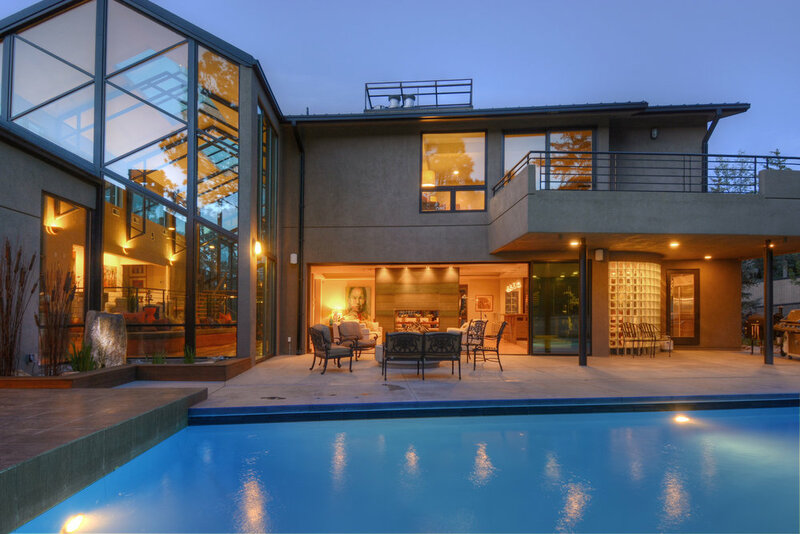 When opened, these sliding glass doors create a 20’ foot opening onto the patio area. The dining room, which mirrors the living room, also enjoys the floor to ceiling metal fireplace wall, hardwood floors and three coved ceilings with a rectangular glass chandelier in the center ceiling. 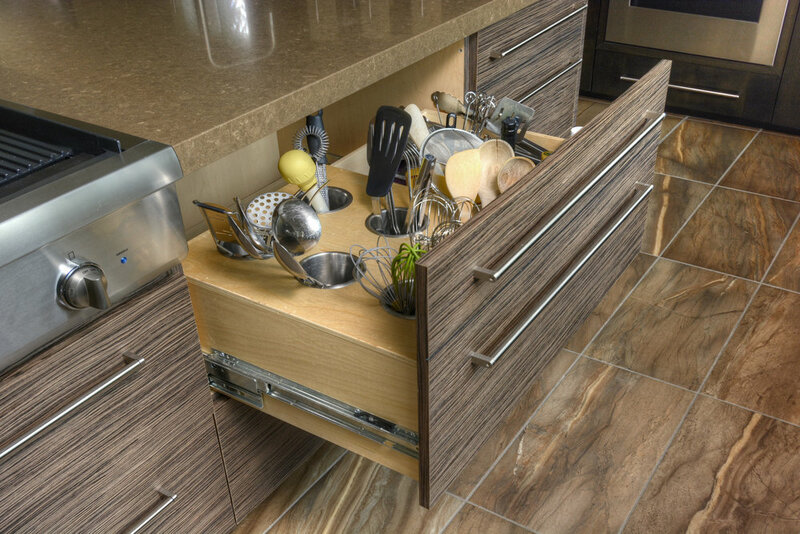 A cook’s dream, the sleek kitchen boasts porcelain tiled floors, quartz countertops, two under-mount sinks and zebra wood cabinets with amazing pullouts to include a utensil drawer, trash drawer and 3 vertical pullout racks for spices and smaller items. The kitchens center isle has display shelves and an under-mount vegetable sink. Located between the dining room and kitchen, there is a second counter/workspace with four pendant lights above, counter seating and an abundance of cabinets. Kitchen appliances include a stainless Thermadore gas range with 4 burners, griddle and grill; a Sub Zero refrigerator/freezer; beverage cooler; double wall ovens, microwave, two dishwashers and a Thermadore warming drawer. 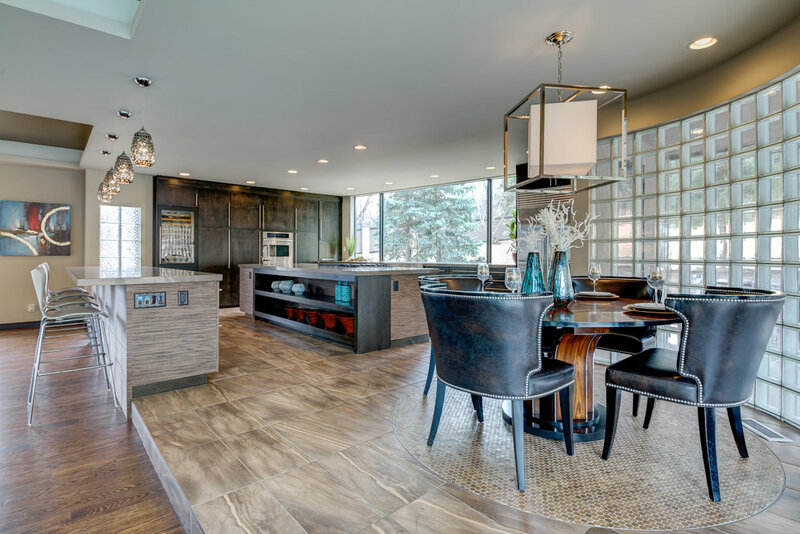 Adjacent to the kitchen there is a casual dining area with tiled floors and a curved glass block accent wall. The amazing family room also has a set of stackable sliding doors that create 20’ opening to the patio. This room also offers a 16’ peaked wood ceiling and a floor to ceiling travertine fireplace with gas logs that is flanked by floor-to-ceiling windows. Great for entertaining the room has media capabilities with a drop down wide screen, audio visual equipment & a projector. A sleek black wet bar adjoins the room and features a curved tiled countertop with subtle leaf motif, wine cooler and dishwasher. Next to the wet bar there is a sleek black bathroom that has a mosaic tiled floor with a metallic sheen, vanity with oblong sink, tiled shower, tiled walls with a stacked slate look and built-in bench with storage cabinets underneath. The dramatic office with sitting area has a vaulted and peaked wood ceiling, hardwood floors and a 3-sided gas log fireplace. The desk area offers a plethora of bookshelves and built-ins. From the office, a hallway with hardwood floors and peaked skylight leads to the guest/family wing. Located on the first upper level, the guest wing is what remains of the original home. Updated, this area has two guest bedrooms with mountain and city views. These two bedrooms share a glamorous bath with slipper tub, vanity with quartz counter, tiled shower and tiled floor. One of these bedrooms offers direct access to the bath, a side door that opens to a covered patio and a peaked ceiling. The other bedroom has a vaulted ceiling and a sliding glass door to the covered deck. Additionally there is a guest suite with private bath. This bathroom has a jetted tub with shower head, tiled floors and vanity with quartz countertop. A spacious laundry room with tiled floor completes this level. French doors with ribbed rain glass panels lead to the spacious master bedroom. Loaded with glass, the master bedroom has a peaked ceiling, a wall of glass & a walkout to a wrap-around patio with Batu wood floor. The master also has a unique accent wall with built-ins, a sink and a gas log fireplace that can also be viewed from the master bath. This fireplace has sculpted gas logs and is a miniature version of the big fireplace in the great room. A sliding ribbed rain glass door opens to large master closet with built-ins and a washer/dryer hook-up. 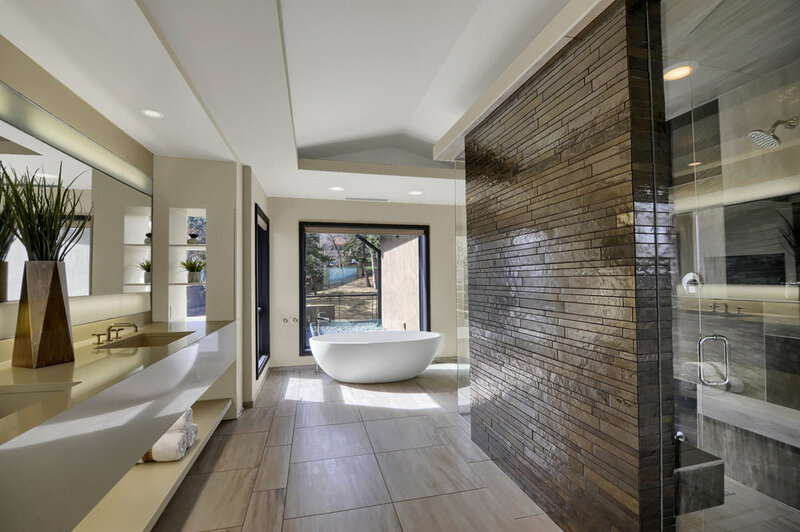 An identical sliding glass door opens to the sumptuous master bath that boasts a huge walk-in tiled steam shower with 3 shower heads, free-standing oval tub and a sleek suspended quartz vanity with two sinks and shelf underneath. 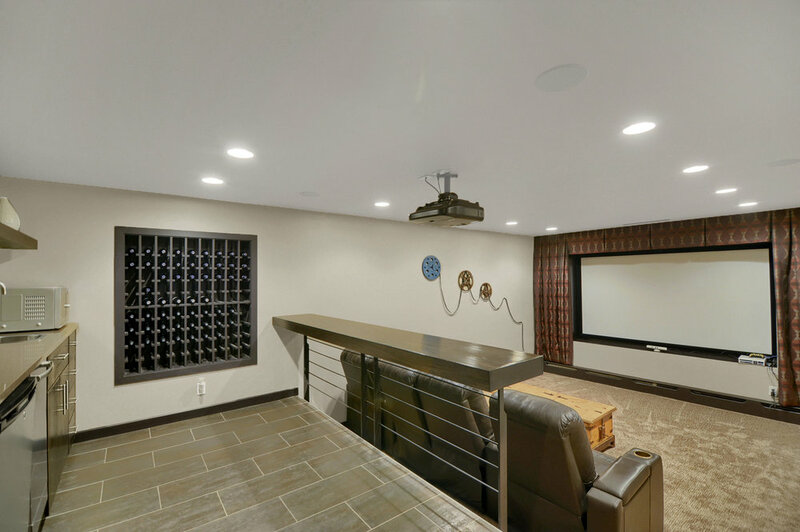 Perfect for relaxing, theater room comes complete with a wide screen, projector, built-in speaker and all the audio equipment. At the rear of the room there is an upscale beverage area with built-in cabinetry, wine rack, refrigerator, dishwasher and counter space with quartz countertop. Next to the beverage area, you’ll find counter seating for viewing your favorite movie. Lastly, there is a built-in cubby with a cushion that matches the drapes on either side of the wide screen. Located on the lower level, the guest bedroom is carpeted with a walkout to the front of the home where the front waterfall awaits. The adjoining private bath features an amazing tub/shower that is designed like a swimming pool. The glass tub/shower has a tiled basin and a built-in shelf that runs the length of structure. The bathroom also offers a dual vanity, arte niche with three lit shelves and a water closet area. There is also spacious closet off the bath.